Why not prepare it at home? I usually do, though sometimes it's handier to buy. In Bradford, they serve(d) it raw with vinegar. Nasty. My granny used to batter and deep fry it in her chip shop (on Merseyside). Popular years ago, though you probably couldn't give it away free nowadays. Oh yes, it's a lot blander than the German variety, that's for sure. egg custard tart. Not sure if we have anything similar in Poland. ? I googled pics of it and I sometimes see similar cakes in pastry shops but my wife says they don`t belong here, must be imitations from foreign cuisines. 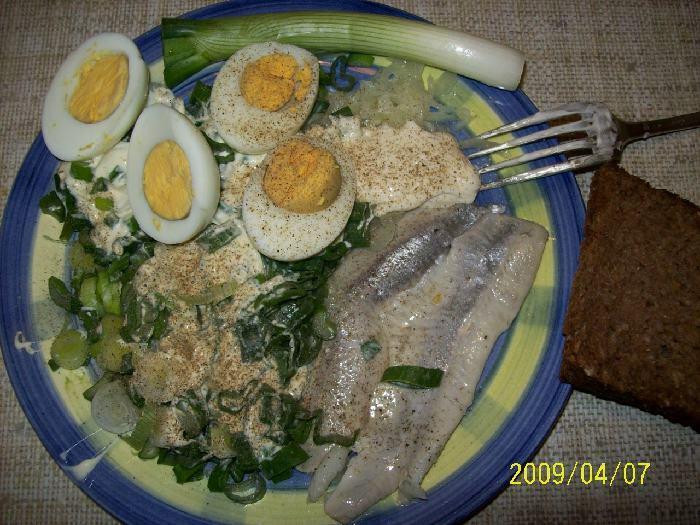 My fav way is herring ala Japanese - with a boiled egg and lost of raw onion and mayonaise. Not sure if we have anything similar in Poland. ? Polish herring (sledz) is quite tasty. But it must be pickled/soused. I tried smoked and fried herring and the bones are hopeless - never again. Whoops, almost forgot to add to my favorites list, a nice shot of Zubrowka after the meal. Really settles the ol' stomach. I came back home at 7 pm and ate a giant plate of paella, thick, with an extra portion of shrimp and mussels. After an hour, I started to feel hungry again. It just came to my mind that Polish food must be so fatty and full of calories - how would Poles survive those harsh winters in the past and today? A Vatican delegate to Poland wrote in his diaries a few hundred years ago - They eat little veg in Poland, but each Pole eats as much meat as 5 Italians.. A Polish saying from the time - An Italian thrives on lettuce, a Pole loses weight with it. Once I hated fat in my meals, today I thrive on it. 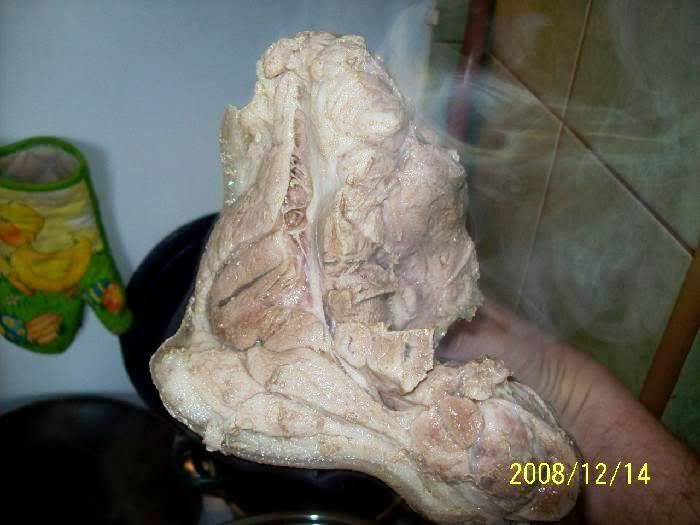 Golonka - pork knuckles - one of the fattiest ingredients/dishes. One bottle for two should be enough. If you are a hard drinker, let`s get two bottles. 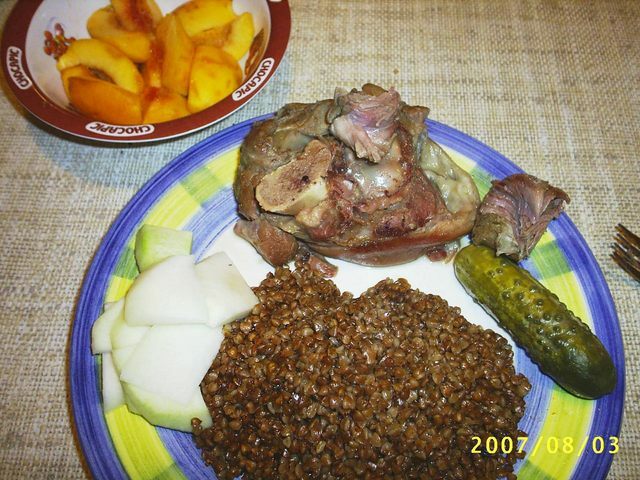 I would call golonka 'hamhock' (a southern US dish mostly, though not exclusively, associated with Blacks). I think that one bottle between two is more than enough......and I enjoy a drink. In Yorkshire we called it pork hock. I used to buy them and boil them up. Cheap and tasty. The various Polish way of doing them can be good. Back when I ate pork, I braised them in beer and finished them off in the oven. Sucking pig is an interesting Polish food, though only really for banquets. Stuffed with kasza and with an apple in the gob. Better have a 0.7l in reserve. So you don't have to go to the beeroff in the middle of the night. Golonki can be delicious, and that's a fact! when I was over there, albeit far too briefly. Cheap and tasty. The various Polish way of doing them can be good. Yes, cheap. Actually the cheapest of all. Lucky me because I can be so mean. :) Tasty - abundantly. It is one of few kinds of pork which, when boiled long enough, offers such soft meat that it virtually melts on your tongue. Yes, we must mention it in What do Poles owe to Germans thread :) The transition took place during partitions, so you couldn`t have noticed it. 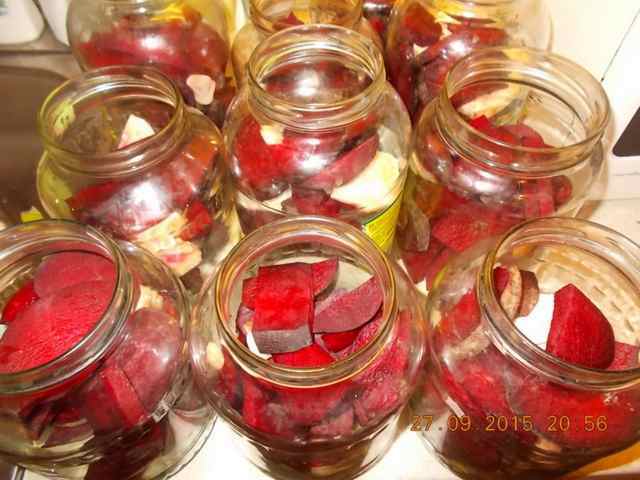 What do you think of fermented stuff? I like everything that tastes sour. 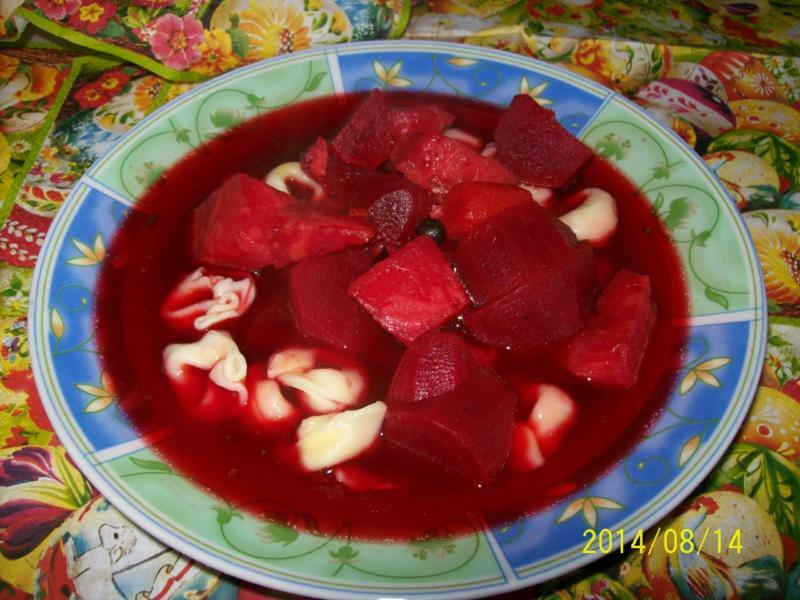 E.g., one of my fav, fermented red beetroot juice is used to make traditional borsch soup or can be drunk solo. I have just had a morning glass of it. Some makers call it kvass. Read about its beneficial influence. See how to make it - put all the ingredients (celery, garlic, ginger, horseradish, herbs) into jars, pour on quality water and wait a few days. I have to say I didn't much like sour things before moving to Poland.... the first time I heard of zupa ogórkowa I was aghast pickle soup? But now I love it, the more sour the the better. Also, horseradish! I never liked it before living in Poland. But I think I only like Polish horseradish, a year or two ago in a Berlin hotel with soft-boiled eggs for breakfast I tried some horseradish... and it wasn't very good. I don't know why Poland does it better than other countries but it seems to be how it is. I find it rather mild compared to the type I'm used to. The milder sort (depends how the root is grated) does work better in large quantity though. Do you like ćwikła? I can take it or leave it, however home-made is much better than the usual stuff in PL from jars. Grate and mix with sour cream, or beetroot juice. A lot of health benefits. The various sauces made round the world with it vary in two ways. One is whatwver is put in it to make it a sauce (and how much is added), the other is how much is grated from the outside or from the centre; this affects the heat. 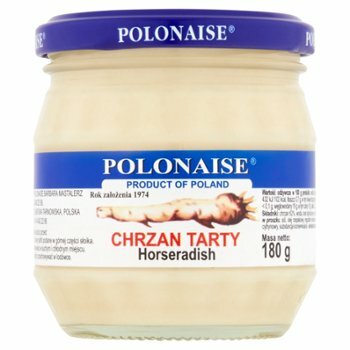 Polish tastes tend toward the mild and creamy. 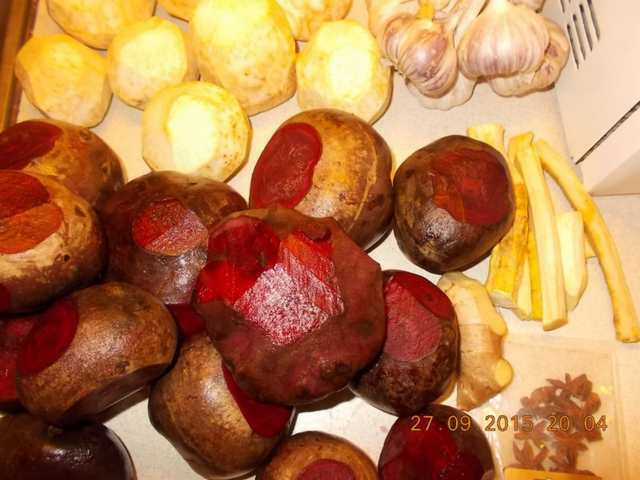 The variety of plant varies too; the kind that people grow in Poland tends to have narrower leaves than the kind in the UK, and suits the dryer climate it grows in. Well drained and rich soil. Keep it well-watered in summer, and harvest iafter the first frost. Don't pick all of it every year; leave some and it will grow like a weed. Polish tastes tend toward the mild and creamy. Me too. Don't get me wrong I love heat, just more from chillis than horseradish, when I still lived in the US I regularly devoured mass amounts of chillis in various ways, generally red (or occasionally fresh green, but preserved green chillis... it's off to the bathroom and not a pretty process). I once made a sauce from chillies, horseradish and (English) mustard powder. It took no prisoners! however home-made is much better than the usual stuff in PL from jars. Grow it in the garden, or your allotment. Thanks for the idea, I must try it out. Is it by chance this producer? I have tried a few horseradish jar products and this one has been the tastiest, since 1970s I guess. I was once suffering with a ridiculous amount of work at the end of the school year, and so I bought some meatballs in a jar from Biedronka. so I bought some meatballs in a jar from Biedronka. Worst idea ever. I think everybody has had such an experience in their life. That would have been fierce!!!! Chillies are of course the hottest,but English mustard is even stronger than Dijon.....and add the Polish horseradish and next day is mainly spent in the bathroom.... LOL!!! English mustard is even stronger than Dijon. Really? I thought Russian mustard is the strongest of all. It has 2 or 3 chilli symbols on the label, while the English mustard has only one.